Hinshaw, Thomas, head-of-household, age 27, born in Indiana; parents born in Indiana; first marriage, married 5 years; occupation: liveryman; owned home (mortgaged). 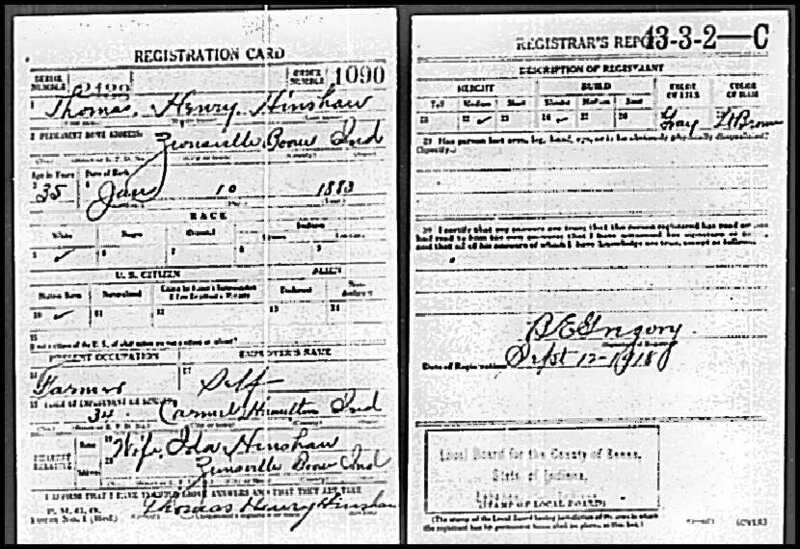 Hinshaw, Ida, wife, age 27, born in Indiana; father born in Germany; mother born in Indiana; first marriage, married 5 years; 2 children, 2 living. Hinshaw, Mildred, daughter, age 3, born in Indiana; parents born in Indiana. Hinshaw, Carleton, son, age 1, born in Indiana; parents born in Indiana. Hinshaw, Thomas H., head-of-household, age 37, born in Indiana; parents born in Indiana; owned home; [..occupation unclear..]. 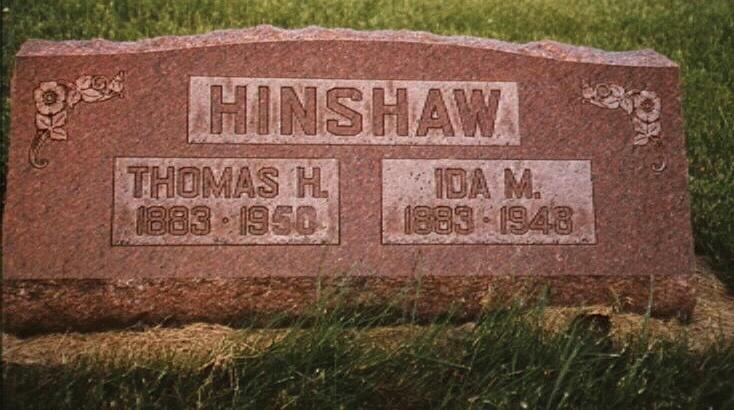 Hinshaw, Ida [unclear], wife, age 37, born in Indiana; father born in Germany; mother born in Indiana. Hinshaw, Mildred, daughter, age 13, born in Indiana; parents born in Indiana; attended school. Hinshaw, Carleton, son, age 11, born in Indiana; parents born in Indiana; attended school. Hinshaw, Anna, daughter, age 8, born in Indiana; parents born in Indiana; attended school. Hinshaw, Donald, son, age 4, born in Indiana; parents born in Indiana. Hinshaw, Leon, son, age 2 years 1 month, born in Indiana; parents born in Indiana. Hinshaw, Thomas H., head-of-household, age 47, born in Indiana; parents born in Indiana; first married at age 23; owned home; no radio in home; occupation: farmer, general farm; not a veteran. Hinshaw, Ida, wife, age 46, born in Indiana; father born in Germany; mother born in Indiana; first married at age 23. Hinshaw, Donald, son, age 14, born in Indiana; parents born in Indiana; attended school. Hinshaw, Leon, son, age 12, born in Indiana; parents born in Indiana; attended school. Hinshaw, Velma, daughter, age 10, born in Indiana; parents born in Indiana; attended school. Hinshaw, Max, son, age 7, born in Indiana; parents born in Indiana; attended school. Hinshaw, Clayton, son, age 4 years 7 months, born in Indiana; parents born in Indiana. Hinshaw, Thomas, head-of-household, age 58, born in Indiana; completed 8th grade; on Apr 1 1935 was living in rural Hamilton County, Indiana; owned farm ($250 value); occupation: gardener & caretaker, private home; worked 28 weeks in 1939; $400 wages in 1939, plus other income. Hinshaw, Ida, wife, age 56, born in Indiana; completed 8th grade; on Apr 1 1935 was living in rural Hamilton County, Indiana. Hinshaw, Max, son, age 17, born in Indiana; completed 3 years of high school; on Apr 1 1935 was living in rural Hamilton County, Indiana; attended school; occupation: attendent, filling station; worked 52 weeks in 1939; $780 wages in 1939, plus other income. Hinshaw, Clayton, son, age 14, born in Indiana; completed 7th grade; on Apr 1 1935 was living in rural Hamilton County, Indiana; attended school. There is a great deal in being born under a good eye, one that watches and guards off the error and folly that overtake so many young men. The parents that are able to infuse into their children the spirit of the Spartans -- the spirit that can meet any fate and make the most of the world -- will see their children grow to years of maturity with excellent habits and splendid principles and see them become exemplary citizens. T.H. Hinshaw, an enterprising young liveryman of Zionsville, Boone county, was fortunate in having intelligent, kind and enterprising parents, who took much pains in his rearing. He was taught from the start the duties of life, not ordinary instruction, but the higher duties which all owe to each other and to society. The result has been to give him broad ideas of life and its responsibilities and to fit him for honorable citizenship. Mr. Hinshaw was born on the home farm near Carmel, Indiana, January 10, 1883, and is a son of Frank and Anna (Henley) Hinshaw, who live on a farm east of Zionsville, where they are well-known and regarded by all as good citizens. They have seven children, five sons and two daughters. Our subject was reared on the home farm where he did his full share of the work when growing to manhood, and he received his education in the common schools of his neighborhood. When twenty-two years old he married Ida Ortwein, who was born in Boone county, where she was reared and educated. To this union three children have been born, Mildred, Carleton and Anna. Mr. Hinshaw came to Zionsville some time ago and is now proprietor of a large livery, sale and feed barn, doing an extensive business which is constantly growing. He is well-equipped with good horses and buggies and always carries a good line of feed of all kinds, and his is one of the most popular establishments of its kind in the county, partly because of his energy and foresight and partly because of his honesty and courtesy in dealing with the public. This has long been a livery and is well-known and popular with the traveling public. Our subject has remodeled his barn and made numerous improvements of late and everything is kept in proper place and in good shape. He has new rigs and a standard make automobile. His barn is one hundred by seventy-five feet, giving abundance of room for the accommodation of eighty horses at one time. His barn is centrally located, near the depot. Politically, Mr. Hinshaw is a Progressive. Fraternally, he belongs to the Knights of Pythias, and he and his wife are members of the Christian church. 1920 census, Clay Township, Hamilton County, Indiana; roll T625-435, ED 93, page 9B, line #77, dwelling #231, family #231. 1940 census, Clay Township, Hamilton County, Indiana; roll T627-1050, ED 29-5, page 8A, line #6, household #173. Indiana Marriages, 1845-1920; http://www.ancestry.com (Book 12, page 176). 1920 census, Clay Township, Hamilton County, Indiana; roll T625-435, ED 93, page 9B, line #84, dwelling #232, family #232. 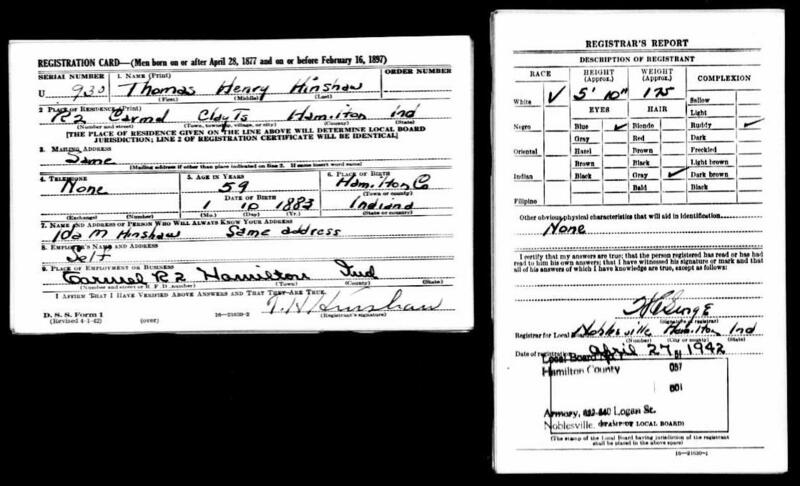 1930 census, Clay Township, Hamilton County, Indiana; roll T626-590, ED 5, page 4B, line #68, dwelling #116, family #116.